Boa constrictors are among the largest snakes in the world and can range in length from 8 to 13 feet although lengths over 11 feet are considered rare. They weigh between 60 to 100 pounds. Boa constrictors have body colors ranging from tan and red to yellowish-green. Their bodies display distinct patterns such as diamonds, circles, and lines. These are just a few of many boa constrictor facts. The boa constrictor gets its name from the manner in which it captures and kills its prey. Once the snake has bitten its prey to hold on to it, it constricts its body around the animal to use its powerful body to kill the animal by cutting off its blood supply. 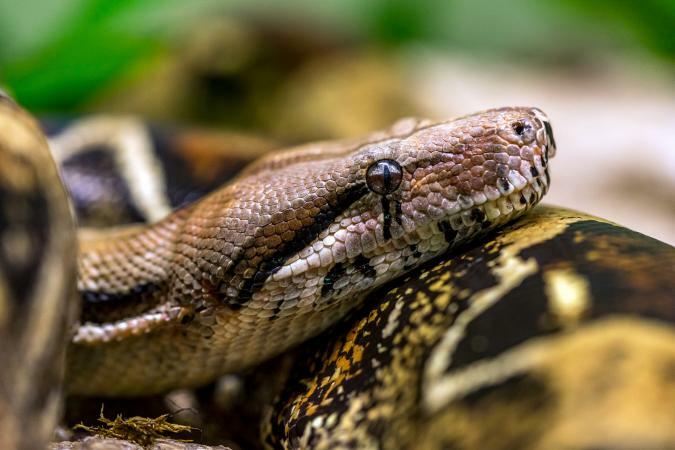 Boa constrictors typically eat amphibians, birds, bats, rodents and other small animals, but they have been known to prey on monkeys, pigs, and even small deer. Boa constrictors are one of the snakes with the longest lifespans. The oldest snake on record was 40 years old but on average a boa constrictor can live about 35 years. Boa constrictors are a "primitive snake" which means they have two lungs instead of one and their skeletons still have a vestigial set of back legs and pelvic bones. Unlike pythons, the boa constrictor gives birth to live snakes rather than laying eggs. When a boa constrictor gives birth, they can have up to 60 live baby snakes that can live independently of their mother right at birth. Females are larger than males, with female snakes growing to about 10 feet long whereas males grow to about 8 feet. Boa constrictors can be found in Mexico, Central America, South America, and the Caribbean. There are over 50 species of snakes that constrict and these are known as "boas" but in fact, there is only one species with the name boa constrictor. Boa constrictors tend to move in a straight line due to their size. Smaller snakes, by comparison, move forward in a zig-zag motion. Firm skin and good muscle tone, feel the snake's body to check for signs of injury. Heat lamps and ceramic elements can be mounted to the top of the enclosure to direct heat downward. Heat tape or adhesive pads can be placed on the underside of the glass enclosure. Boa constrictors do not require UV (ultraviolet) light to maintain their health, but you can use a light if you want. If you choose to use light, use full-spectrum lighting or a low-watt incandescent bulb during the day. Place the lighting in a way that the snake does not come into direct contact with the bulb. Snakes can be seriously burned if lights are placed incorrectly. Boa constrictors are carnivores and eat live prey. Boa constrictors can be fed once a week to a couple of times per month, depending on the age of the snake. Baby boa constrictors grow faster than adults so they require more frequent feedings. A good rule of thumb to remember when feeding is that the prey should be no wider than the widest part of the snake's body. Pet boa constrictors can eat pre-killed prey such as rats and mice. Always provide your boa with a clean bowl of water. Boa constrictors are classified as exotic pets, and there are laws that vary from state-to-state regarding the ownership of exotic animals. For example, Florida requires boa constrictor owners to have a permit, while Pennsylvania has no specific laws regarding reptiles. Each state has different laws, so before getting a boa constrictor to keep as a pet, you should contact your local game commission to find out the legal aspects of ownership. Take your new boa constrictor to the veterinarian for an initial examination then follow up with routine visits for maintain its health. Boa constrictors can become infested with parasites that could eventually be fatal. Some infestations can also be transmitted to humans, so it is important to always cleanse your hands after handling your pet or its habitat. Boa constrictors can live 20 to 30 years in the wild, so with proper care and maintenance your boa can lead a long, healthy life.